This is a fascinating and uncomfortable read. The main character Paul-Jean Husson is an ageing man of letters who narrates the story. He is a rabid nationalist, an anti-Semite, a decorated WW1 hero who supports Marechal Pétain and is a member of the Académie Française with friends in high places. 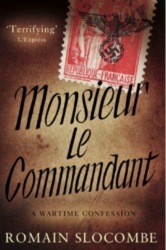 The author captures his world, presents his revolting writings (he wants France to be free of Jews, Freemasons and Bolsheviks) gives voice to his awful racist language and the world of Vichy collaborators and their German friends. The novel is short and takes the form of a letter, written to a high ranking German officer with whom Husson has become friendly through playing chess. The letter chronicles his infatuation with his son Olivier’s beautiful wife Ilse, a moderately successful German film actress in the early ’30s, who the narrator suspects is Jewish. The story is told completely from Husson’s side. German forces arrive in 1940 and a family tragedy destroys any remaining vestiges of pleasantness. Olivier objects to his father’s views and removes himself to England to join De Gaulle. Ilse seeks protection with her parents-in-law, for her and and her children. As anti-Semitism takes hold, Jews lose their jobs, businesses, homes and rights as French citizen and are forced to wear yellow stars. The obsession that Ilse and his grandchildren may be Jewish grows and he hires a private detective to confirm his suspicions. His lust for Ilse remains the same and to protect her from the internment and extermination camps he resorts to even more vociferous attacks on Jews in the newspapers. The tragic and brutal events which unfold are about how he resolves his dilemma. The novel has a compelling denouement and ultimately it’s a brutal story of treachery. This entry was posted in Book Reviews, Books and tagged Monsieur le Commandant, Romain Slocombe. Bookmark the permalink.